While I have talked about Fashion Week nail trends (here and here oh and a how-to here) I figured it was time to show some of my favorite makeup trends and how to achieve the look. So far Rachel Roy and Betsey Johnson have my favorite looks when it comes to makeup trends! Many of my favorite trends use MAC Cosmetics. However my two absolute favorites Betsey used Stila and Ms. Roy used Bobbi Brown. Face: Begin with MAC Face and Body Foundation in a shade that matches your skin tone. Next apply Mineralize Bronzer Give Me Sun (only to high cheekbones and temples). Lips: Get a pale beige shade called Supremely Confident. Face: You will want to even out your complexion with One Step Makeup and hot pink blush to the apples of the cheek. Eyes: Use the Palm shade for Fiji Palette No. 5 (Kelly Green) all over lid and to the brow...you'll want to extend past the top and bottom eye lines. False lashes. Face: Mix Face & Body Foundation with moisturizer (this allows for the sheerest cover.) The cheeks are covered with Blushcreme in Ladyblush and Brit Wit. Eyes: A hint of taupe eye shadow. Lips: lip conditioner and concealer. Face: Bare besides Pearl Cream Color Base used as a highlighter. Eyes: Bare besides Pearl Cream Color Base used as a highlighter. Lips: Chromagraphic Pencil in Process Magenta followed by Neon Pigment in Magenta Madness. Face: To highlight the cheekbones use Pearl and Bone Beige. Eyes: You want to create a pastel eye look so use Layer Paint Sticks in Pink & White, Blue & White as well as Yellow & White on the lid. Edge the lash line in Smolder, and add mascara. Eyes: On the lid: Mega Metal Shadow in Dalliance. To the crease: Paint Pots in Dangerous Cuvee as well as Lilac Metal. Lips: Kissable Lip in Vanity Fair. Face: Flawless and Natural Foundation. Use Pen in Pal Face Highlighter as blush and place on the cheeks and angle upward. Eyes: On upper lid only use Black Ink Gel Liner heavily , and finish the eyes with a small amount of Beige Shimmer Brick. Add heavy amounts of mascara. Face: Use Select Moisture Cover and place Lady Blush high on the cheeks and temples. along with Refined Deep Bronzer. LOTS of bronzer! 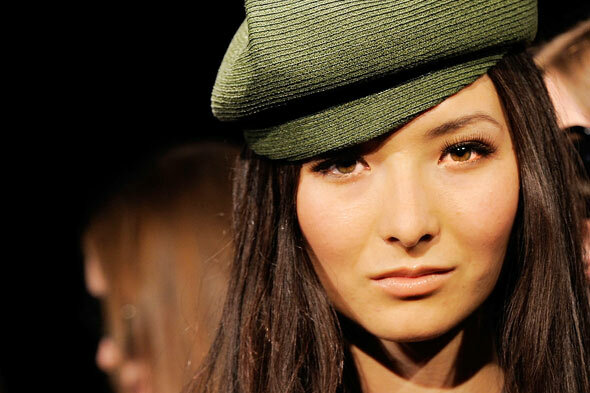 Eyes: Use a gold shadow with a deep army green brown color to contour the eyelid as well as brown mascara. Lips: Use a peachy pink on the pout. Are you loving any of these looks? Would you wear any of them? I love all of the fresh looks for spring. And as much as I want to love DVF's makeup choice, I prefer the muted lips. I think the hair and makeup may be one of my fave parts of those fashion shows. That Rachel Roy look is so chic! I LOVE the Lica Luca look! I just think the makeup is so soft and pretty. Thanks for the tips! I never know what to do. I love the look by Luca Luca. It's so pretty and easy on the eye. The one by Rachel Roy looks more glamorous. It's perfect for a night out on the town. so lovely! cant wait to try. I love all the gold! Nail the half-moon mani AKA "the Ruffian"